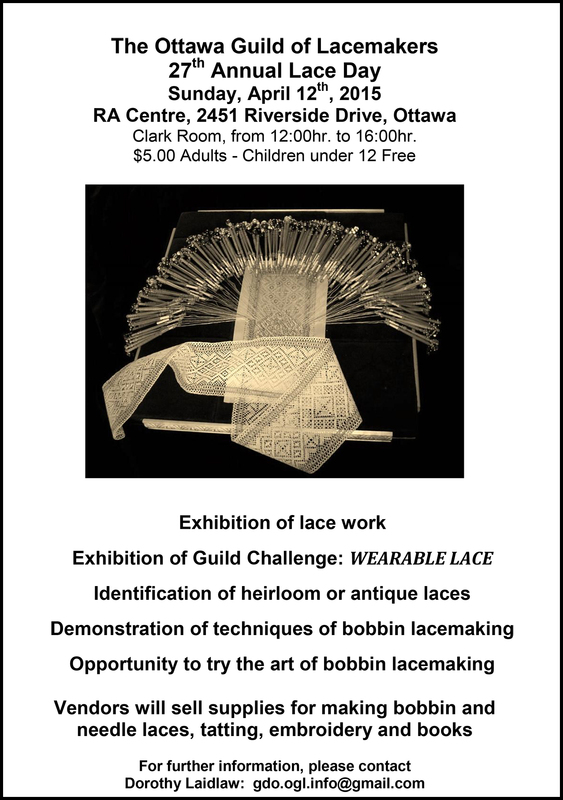 Events: Guild members will display some of their work, and experienced lacemakers will be on hand to identify heirloom/antique laces. They will also demonstrate the techniques of bobbin lacemaking. This is a family event with a great opportunity for children and adults to try their hand at the art of bobbin lace making. Competition: Every year the Guild challenges members to create works related to a theme. This year’s theme is ‘WEARABLE LACE / DENTELLE A PORTER’. Visitors will be able to vote for their favourite item in the theme competition. Exhibits: ‘WEARABLE LACE / DENTELLE A PORTER’, and laces produced in the current year in any and all styles. 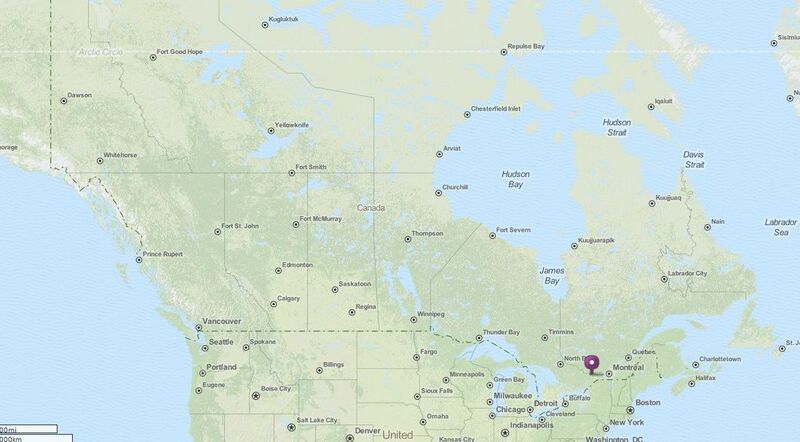 Vendors: Vendors from Canada will have books and merchandise of interest to bobbin lace, tatting and needle lace enthusiasts. The Ottawa Guild of Lacemakers, comprised of lacemakers from the Ottawa and surrounding areas including the Outaouais, is a non profit organization whose purpose is to promote the art of bobbin and other types of lacemaking. While we are interested in all forms of lace, our main interest is in bobbin lace. The Guild promotes the exchange of ideas and techniques amongst members, offers workshops by local and international teachers, and maintains a small library. 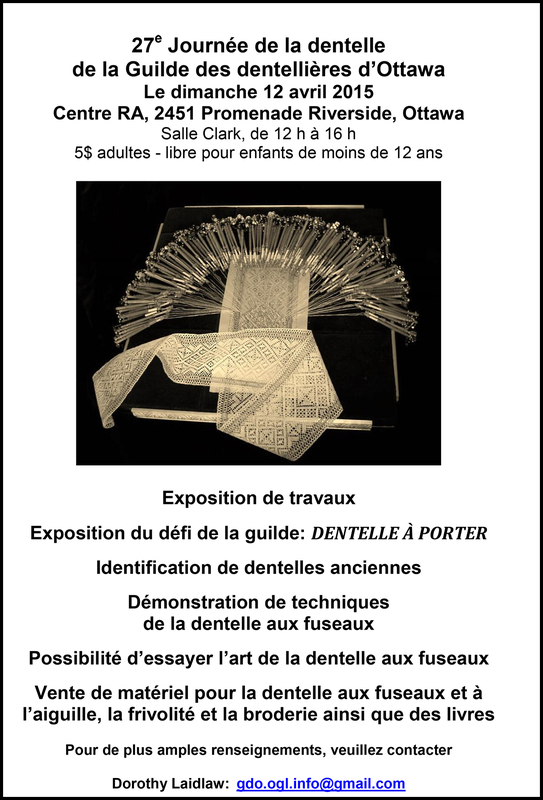 The Guild meets on the second Thursday of the month at 6:30 pm and on the third Saturday for a day of lacemaking at the Trille des Bois School, located at 140 Genest Street, Ottawa.